The global magneto rheological fluids market faces stringent competition among established players. The seething demand is paving way for new companies to enter the market. To stay ahead in the league, existing players are expanding into new territories. Introduction of innovative products is also impelling growth in the global magneto rheological fluids market. 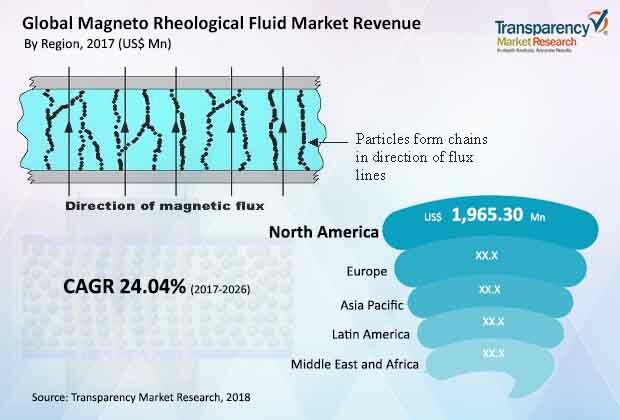 Technological advancements are helping companies explore new applications, intensifying competition in the global magneto rheological fluids market. Some of the prominent players in the global magneto rheological fluids market are MRF, CK Materials Lab, Ioniqa Technologies, Arus MR Tech, and Lord Corporation. The global magneto rheological fluids market was valued at US$5.1 billion in 2017, a Transparency Market Research report said. It also projects that the market will rise at approximately 24.0% CAGR and to reach worth of US$33 billion by the end of 2026. Geographically, Asia Pacific will continue to hold the highest share of the global magneto rheological fluids market. The increasing awareness about numerous technological benefits of magneto rheological fluids is escalating their use here. Besides, Europe will continue to remain significant and will grow at a steady rate. Among the various applications of magneto rheological fluids, automobiles and robotics are gaining impetus. The rapid automation of several industries and the increasing demand for premium automobiles will drive the uptake in these industries. Advancements in science and technology have proved immensely worthy for the global magneto rheological fluids market. New technology has helped identify applications in robotics, electronics, automobiles, and optics. Magneto rheological fluids are traditionally used in only clutching and braking systems. Today, leading automobile manufacturers are using magneto rheological fluids-based suspension systems. In the coming years, more automobile makers are expected to utilize magneto rheological fluids-based suspension systems, boosting the global magneto rheological fluids market. Automation has become an integral part of every industry today. Movement is a key aspect for successful functioning of a robot. To facilitate this, manufacturers are using magneto rheological fluids. With demand for robots shooting up, the global magneto rheological market is expected to grow significantly. Similarly, magneto rheological fluids are also finding importance in healthcare. Their ability to facilitate smooth movement makes them ideal for prosthetics. A wide range of magneto rheological fluids are in final stages of testing, thereby keeping the production low. This has kept the pricing high. Besides, the market is quite nascent. However, new products in the coming years will increase production volumes, therefore lowering the price. On the other hand, increasing utilization will instill awareness about the advantages of the product. This will push the demand and bring down the cost, creating promising prospects in the global magneto rheological fluids market. The study presented here is based on a Transparency Market Research report titled “Magneto Rheological Fluids Market (Base Fluid – Silicon Oil, Mineral Oil, Synthetic Hydrocarbon Oil, Parffin Oil, Hydraulic Oil, and Water Application – Automotive, Aerospace, Building & Construction, Military & Defense, Optics, Electrical & Electronics, Medical & Prosthetics, and Robotics) - Global Industry Analysis, Size, Share, Growth, Trends, and Forecast 2018–2026”.